Thurman Munson died thirty-nine years ago Thurday. It was August 2, 1979. Some from the younger set will ask ‘who was Thurman Munson?’ Others might recall the name. But if you are a baseball-loving boomer you either loved him or loathed him. Few were indifferent. 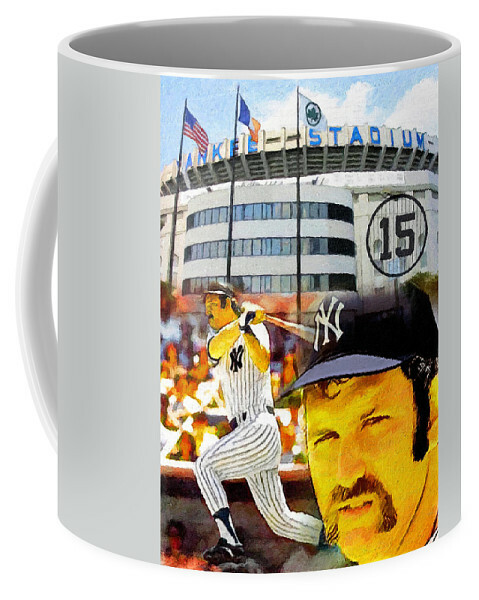 Of course, Thurman Munson was a catcher for the New York Yankees. He played baseball with a middle linebacker intensity. He was the heart of the 1977 and 1978 World Champions. He was the Yankees captain, the first since Lou Gehrig in 1939. Joe DiMaggio, Yogi Berra and Mickey Mantle were never Yankee captains. Thurman Munson was. He had that all important hat trick of talent, leadership and respect. Munson, who on the surface was a mustachioed, snarly curmudgeon, was loved by everyone is his locker room except for maybe Reggie Jackson. That ironically made Thurman even more lovable, probably to non-Yankees fans, too. He played eleven seasons in pinstripes, was a seven time All-Star, the American League Rookie of the Year in 1970, and the AL Most Valuable Player in 1976. His number #15 will never be worn again, except by dozens of Yankees fantasy campers. He hated the Red Sox with all the fire and passion he could muster and he played like it. Yankee fans revered him. To me, Thurman Munson was more than a legend when he died in 1979 at the age of thirty-two, loving what he was doing at the time even more than baseball: piloting his own airplane. It was that Cessna Citation that allowed him to fly home to Canton, Ohio numerous times during the long baseball season to see his wife Diana and their kids. 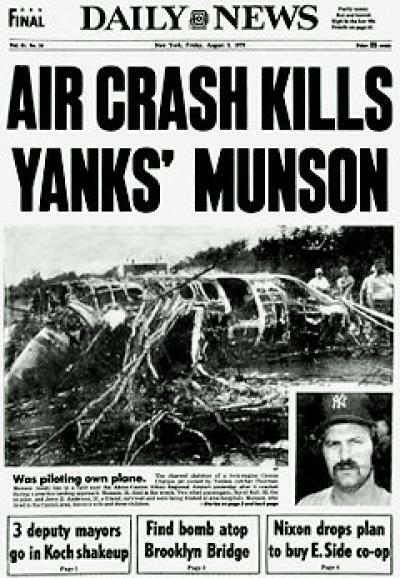 The crash happened during an off day for the Yankees while Munson was doing a practice run of touch and go landings at the Akron-Canton Airport. His two passengers walked off the aircraft but Munson, with a broken neck, died of asphyxiation from the flames. Thurman was the first baseball player I ever personally knew. More importantly, he was the first baseball player that ever knew me. If you were a kid growing up during the fifties and sixties, you know what a big deal that was. We idolized ballplayers as kids. We wanted to be them. There was no daily medium that personalized these guys back then except maybe a newspaper feature story. We got to see them play on black and white televisions, had their baseball trading cards and mired ourselves in daily newspaper box scores. Weekly we waited for the Sporting News or Baseball Digest to learn as much about their stats as our young teenage minds could comprehend, this side of memorizing our Torah portion. If we were lucky enough to go to a ballgame we saw them from a distance and maybe, just maybe, during batting practice we could get close enough to the field to yell something in their direction and get a nod of approval. Oh my — ecstasy, if that happened. We eventually grew up not being professional baseball players and after a while that was okay. Idolatry gave way to reality and we lived our lives they way as our lives were meant to be lived. Ultimately, a diamond meant a commitment and a not a place to spend nine innings. I met Thurman for the first time in 1976 when the Yankees held their spring training in Fort Lauderdale, FL and I was a twenty-four year director of public relations at nearby Hollywood Greyhound. With mainly daytime exhibition games in those days, Thurman loved to bet the dogs in the evenings. The Yankees PR department would phone me ahead of time to tell me he and Diana would be coming to the track that night for dinner and wanted me to have a table reserved for them in the popular clubhouse restaurant. He and Diana would come to the track by themselves but he always wanted a table for four so he could spread the racing program and tip sheets on the table while they would eat and wager. After a while Munson would phone me directly to let me know he was coming to the track and I would spend part of the evening visiting with them. Well, more with Diana than Thurman, who had his head mired in the racing form like a history major cramming for a math final the next morning. One night, somehow, I was able to distract him enough to come down with me to the winner’s circle for a picture with the race winner. It remains one of my baseball treasures. There was never any love lost between Munson and Boston’s Fisk. Our friendship would rekindle every spring when the Yankees were in training camp. He would freely call and the Hollywood switchboard operator was told to always find me. I wasn’t going to miss a Thurman Munson phone call, especially and unbeknownst to me at the time, he was transitioning me from a lifelong PIttsburgh Pirates fan and Yankees hater to a Yankees lover. I’m still not sure how that could have happened. The summer of 1978 was my greatest Thurman Munson memory. It was the weekend after Labor Day. Six weeks earlier the Yankees trailed the Red Sox by fourteen games. George Steinbrenner fired Billy Martin for the first of five times and brought in Bob Lemon to steady the ship. It was like replacing Donald Trump with Mr. Rogers. When the Yankees hit Fenway Park in September they were on fire and only trailed by four games in the standings. The weekend became known in Yankees annals as the ‘Boston Massacre’ with the good guys sweeping the four game series by a combined scored of 42-9, leaving the Back Bay in a tie for first place. In fact, it’s eerily similar to what the Red Sox are doing to the Yankees this weekend in Boston. I went to the Saturday afternoon game of the ‘78 series with Greg Farley, the racing writer for the Boston Herald-American, who to this day is still a close friend. Things were going so well for the Yankees that long-forgotten Jim Beattie, with a record of 3-7, pitched into the ninth that day with the Yankees winning a 13-2 laugher to close the gap to one game. That night Greg and I went to the greyhound races and dinner at nearby Wonderland Park. When we walked into the clubhouse restaurant and the host was leading us to our table we heard a loud shout: “Roy, what are you doing here?” It was Munson at a table with Mickey Rivers, Lou Piniella, Graig Nettles and Ron Guidry, who won twenty-five games and the American League Cy Young award that season. There may have been one or two others in the group but I was so startled I didn’t take attendance. Ironically, a dozen years later in 1990, I became the general manager of Wonderland. My stay in Boston was longer than Anthony Scaramucci’s in Washington but not by much. Back to ‘78 and Thurman asking me sit down and join them. I felt like Dan Quayle at dinner with Churchill, FDR and General MacArthur. I’m certain the other Yankees had no idea who or why this guy with a bad Afro who looked like a cross between Mr. Kotter and the white man’s Oscar Gamble was sitting with them. I laughed when I was supposed to; I rooted for their bets to win and sat in awe the rest of the time. I have no idea what happened to Greg Farley that night but hope he enjoyed dinner as much as I did. The weekend was a prelude to what was to come for the Yankees. 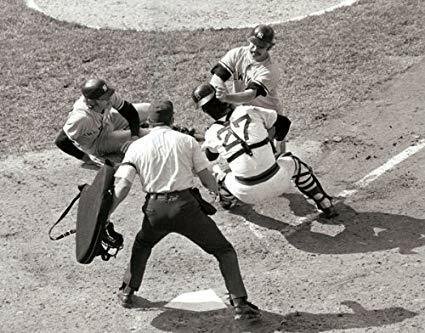 Finishing in a regular season tie with the Red Sox it paved the way for Bucky Dent’s career hit in a one game winner-take-all playoff; then they beat KC in the ALCS and the Dodgers in six in the World Series. Dent will always be remembered for the seventh inning home run over the Green Monster that put the Yankees in the playoff game lead for good but not many remember he was the MVP of the World Series too. It wasn’t until the Yankees reported to spring training the following February that I found out the rest of the story from that Saturday night at the track. I knew Munson hit a trifecta for about $1300 the night we were there. That was a pretty big score back in the day. What I didn’t know until Thurman told me months later was the cash was stolen out of his Fenway clubhouse locker the next day, allegedly by a teammate. It was one of those situations where everyone suspected who did it but nobody approached the guy. Bucky, who I got to know during my years at Yankees camp, graciously wrote the foreword to my ‘Big League Dream’ last year. He was my camp manager in 2014. We were gabbing between innings of a game and I recounted that 1978 night at Wonderland, Munson’s trifecta win and the stolen cash. Without missing a beat Dent gave me the name of the guy everyone suspected of being the perp. It was the same one I heard thirty-five years earlier. For the 1979 season, Martin had been ‘unfired’ by Steinbrenner and was back in the managers office. Munson, now into his early thirties, was beginnng to focus on post-career business opportunities and was interested in me helping him put together an investment group to purchase a greyhound track in New Hampshire that was on the market. He learned the hard way that the only way to make money in the racing game was to own the track. He wanted me to manage it for him. He promised he’d be more patient than Mr. Steinbrenner. Then August 2, 1979 happened. I was working in Connecticut that summer. It was a month before ESPN went on air for the first time and a couple of decades before what became social media, but the news of the airplane accident still traveled fast over network airwaves and radio. Four days later, courtesy of colleague Aaron Silver, we flew privately to Thurman’s funeral in Canton and ironically landed at the same airfield as his accident. We left graveside and flew to the Bronx to watch the Yankees and Orioles in a game the Yankees, still shellshocked and just returning from Canton, didn’t want to play but 36,000 were on hand still weeping as a tribute to our fallen leader. Bobby Murcer, Munson’s best friend, gave us chills walking-off the O’s 5-4 in the bottom of the ninth. No doubt, the Captain left way too early but he was chasing his passion of flight and family. He died as he lived—a nice guy who didn’t want anyone to know it. As I’ve told you, Munson is my son’s favorite Yankee. We had Dent as our special guest at the Rickwood Classic this year and I’ve not met finer gentleman (except Berger, of course). One of your best Roy. Maybe because I loved baseball as a kid. There were only 16 Major League teams then, and I knew almost every player on every team. Now I don’t even know what town the teams are in. Started losing interest when Reggie Jackson would pose for the picture instead of running hard when hitting a fly ball, and getting away with it. I’m a 12 year old kid again thinking of what my reaction would have been at seeing that table at Wonderland Park! What a ballplayer, catcher and hitter. It’s time for the Hall of Fame to wake up and make him a member. I’ve heard that longevity is the issue. That is pain ignorant in my estimation. Great piece that brought back some wonderful memories. Thurman was The Man. He was the most dangerous guy I ever saw with runners in scoring position. That catcher position has caught more than a few great ones, but none better than Thurman Munson. He was headed straight for the Hall.